Home Blog When To See A Dermatologist For Acne? When To See A Dermatologist For Acne? Skin is said to be the largest organ. The skin is the first barrier for protection against external harmful factors including chemicals, physical trauma, and microbes present in the external environment. Every person desires to receive favorable compliments for their appearance. A good, healthy skin, therefore, apart from providing protection, is also one of those factors responsible for making a person seem pleasant and presentable. Looking good and achieving flawless skin is desired by everyone these days. For this purpose, people tend to use creams, gels, lotions, cosmetics, chemical-based products or even natural products to keep their skin healthy and free from acne. Unfortunately, though, this does not always work, as these products which are largely used by the general population may not suit each skin type and each person individually. Prolonged and unmonitored use of such products may then harm the skin resulting in eruptions, the most common form of it being acne. Acne is skin disorder which mostly affects the hair follicles (pilosebaceous unit) produced by blockage of pores with dead skin cells and accumulation of oil (sebum) from the skin. This blockage produces a chronic inflammation in the pilosebaceous unit due to which there is increased production of sebum. This is accompanied by multiple bacteria colonization at the same site. Acne is the most common complaint during adolescence and teenage which may also persist until adulthood. Both men and women tend to be affected, yet teenagers and females are frequently affected owing to the wide amount of hormonal changes that are constantly taking place within the body. The most common site for acne to appear is on the face. In some patients, acne may also be present on the neck, shoulders and back. Irrespective of the factors responsible for acne, such eruptions on the face particularly can develop a sense of inferiority or a lack of confidence among most of the patients, especially teenagers and women. When faced with acne on the face, people we tend to purchase creams, lotions, gels and face wash to use and get rid of the acne. They even try out face masks in an attempt to stop the growth of acne or so that it can than regress in size. But these remedial techniques do not always work; besides, the amount of money spent on these so-called “skincare” products is irreversible. As a result, the acne becomes more aggressive in nature by continuous use of these products. At this time one should stop using these over-the-counter products and not delay visiting a dermatologist for acne. On consulting dermatologist at that stage, they will be prescribed specific medications, supplements and will also suggest an appropriate diet to deal with the problem of acne. Many teenagers experiencing acne for the very first time tend to panic. Teenagers go through a lot of hormonal changes and therefore dealing with acne can become a difficult task. Apart from hormonal changes, several other factors like the kind of lifestyle, eating habits, hygiene, and stress level due to academics can take a toll on the skin leading to acne outbreaks. Mismanaged or untreated acne can leave permanent scars on the face after healing and therefore they need to consult to a dermatologist and start treatment at the earliest. Most of the acne types are not painful unless they begin to form pus within. Acne which is painful is categorized under cystic acne. This type of acne is inflamed and associated with pain. The size of acne is mostly larger than other acne as they have inflamed bumps inside the skin. The pain of pus filled acne is so severe that sometimes even slight touch or a draught of air can become intolerable. 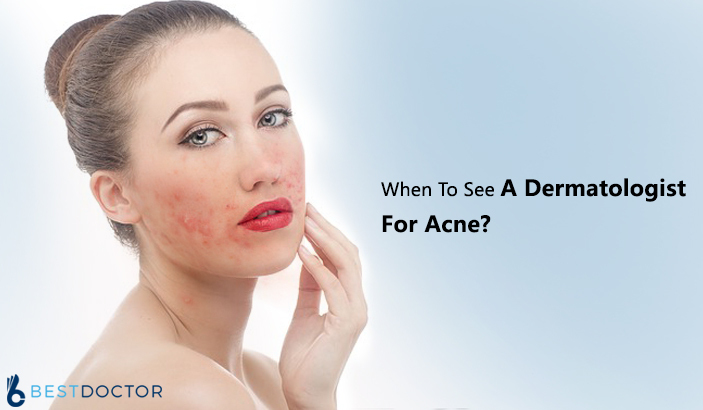 For this one should not wait to consult the dermatologist before getting too late as this acne tends to worsen if left untreated. Treatment mostly involves antibiotics. Acnes are mostly found in females not only in puberty but also in adults; the causes are different than the ones found during teenage. With such drastic change in lifestyle of women over the period of years, many females are diagnosed with illnesses such as PCOD (polycystic ovarian diseases), hypothyroidism, hyperthyroidism and a rare disease like SAPHO (Synovitis, Acne, Pustulosis, Hyperostosis, and Osteitis). These conditions in a female are known to produce severe hormonal derangement and vice versa. Some females also have a tendency of developing acne just before menstruation called as PMS (pre-menstrual syndrome). For this, they should consult with an endocrinologist and also dermatologist and should get treated accordingly. Sometimes acne can make people feel considerably inferior and also lower the level of confidence. Patients, especially teenagers and young adults with acne avoid going to school, colleges, party and others places. Due to this reason, it is important to visit a dermatologist. Acne is a relatively common skin problem. Every person has had acne at least once in their life. Mostly acne subsides by itself without any treatment, yet it is always better to have a proper dermatological consultation for it. Previous PostWhat To Expect From A Pain Management Doctor?